Patricia “Pat” Head Summitt has been the head coach of the Tennessee Lady Vols basketball team since 1974, winning eight NCAA national championships, second only to the record 10 titles won by UCLA men’s coach John Wooden. She is the all-time winningest coach in NCAA basketball history of either a men’s or women’s team in any division. 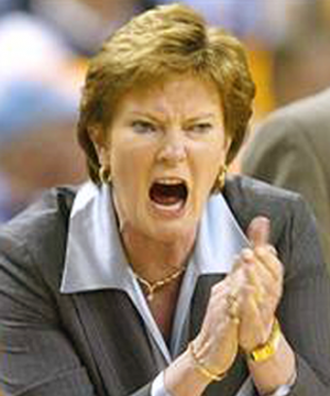 She was named the Naismith Basketball Coach of the Century in April 2000. In 2009, the Sporting News placed her number 11 on its list of the 50 Greatest Coaches of All Time in all sports; she was the only woman on the list. Her teams have captured 32 Southeastern Conference tournament and regular season championships. Tennessee has made an unprecedented 31 consecutive appearances in the NCAA Tournament and produced 12 Olympians, 20 Kodak All-Americans named to 34 teams, and 77 All-SEC performers. Along with the success on the court, Summitt’s student-athletes have had tremendous productivity in the classroom. Coach Summitt has a 100 percent graduation rate for all Lady Vols who have completed their eligibility at Tennessee. Pat has participated in numerous ways in the community. She is an active spokesperson for the United Way, The Race for the Cure and Juvenile Diabetes. She has been a member of Big Brothers/Big Sisters and was the honorary chair for the Tennessee Easter Seal Society in 1985, 1987, 1988 and 1989. She is still active as an alumna with the Chi Omega sorority. In 1994, she served as the Tennessee chair of the American Heart Association. She has received numerous awards for her work in making her community better. This past year, after being diagnosed with early stages of Alzheimer’s disease, she immediately launched a Foundation to raise money to support others with this disease, and to help in the research for a cure to it. As her mentoring of her athletes has played a major role in their development and has led them to lives they would not otherwise have had, so her Foundation will continue to make a difference in the lives of others until a cure is found. Summitt has written two books: Reach for the Summitt, which is part a motivational book and part biography, and Raise the Roof about the Lady Vols’ 1997–1998 undefeated and NCAA-championship winning season.